- Christmas Tree Ornament Set makes your Christmas tree season super easy! - Sturdy, re-usable 108 qt. storage bin contains 122 items carefully packaged for easy accessibility! 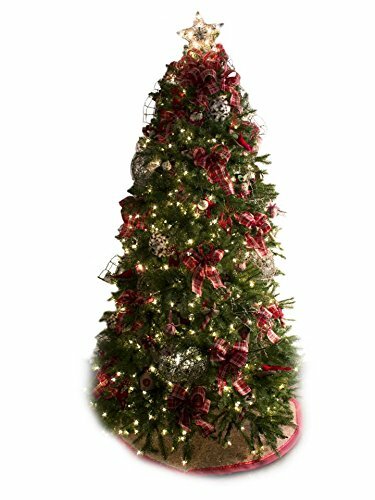 - TreElf Ornament Set includes 25 years of Christmas tree design experience! - Damirscotta's curated design includes: * 18 hand made, 4 point wire edged bows, * 12 (6") candy cane decorative ornaments, covered in burlap, * 3 (12") spheres made of twig - custom dipped in faux snow & iridescent flakes, * 3 (6'0") garlands made of twig - custom dipped in faux snow & iridescent flakes, * 8 (3") decorative balls covered in twine. accented with gingham trim, * 8 - glass, decorative balls, * 3 - over-sized cotton ball ornaments, covered in cotton in its own boll, * 6 red robins + 6 custom nests with sponge moss - custom wired for ornament placement, * 14 red glittered butterfly ornaments, * 5 red glittered deer ornaments, * 6 (5") wooden snowman ornaments, * 3 (3") snowman heads, covered in bulap, * 3 (5") birdhouse ornaments, with burlap details * 3 (3") star shaped snowman faces with burlap details, * 1 - UL approved star shaped topper made of branch like material * 1 - decorative burlap treeskirt * 1 - package of ornament hooks (150 pieces) * 1 - Santa hat! The complete set contains enough ornaments to fill your 6'0" -8'0" live or artificial tree. Ornament Set DOES NOT INCLUDE TREE OR LIGHTS. Set contains small parts_ choking hazard_ must keep out of reach of small children. If you have any questions about this product by TreElf Damirscotta, contact us by completing and submitting the form below. If you are looking for a specif part number, please include it with your message.